Home / Arsenal News / Will retaining the FA Cup be enough next season? 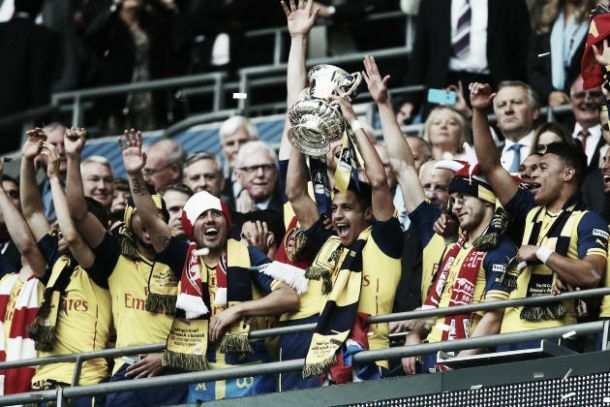 Will retaining the FA Cup be enough next season? Saturday’s FA Cup win was a landmark for Arsenal as they became the first ever club to win the competition twelve times, Wenger has now won the trophy six times which puts him level with former Aston Villa manager George Ramsey who last lifted the cup in 1957. It is still open to debate whether this season has been more progressive than last. A better league finish of third this season compared to last campaigns’s fourth adding to a more emphatic Cup final victory goes someway to suggest it has but less points in the league will raise a good argument for “it is just the same old Arsenal”. Arsenal had an impressive last half of the season but never really got going effectively until the turn of the year, a very poor start saw them lose significant ground to Chelsea and by the end of the Premier League season were it not for that then a League challenge would have been plausible. It was not just in the league Wenger‘s side disappointed. Another uninspiring performance in the Champions League, going out to AS Monaco in the last 16 when they were clear favourites, that is something that needs to be rectified if they are to ditch the tag of perennial bottlers on the big European stage. It is the FA Cup win that saved the season in some respects, going into the last 2 months of the season many had Arsenal to finish second, it would have been a long distant second but a second place nonetheless. Faltering in crunch games against Swansea, Manchester United and Sunderland where they only took 2 points from a possible 9 all but end their chances and they had to settle for third. There are many none Arsenal fans that see the clubs desire for a league title over domestic cups as a bit spoilt and a bit arrogant but that is not the case, when as fans you have seen the 1997/98 triumph and then you take in the scintillating 2003/04 invincibles, followed up with nine whole years of underachievement and transition it becomes hard to take. As Aaron Ramsey said after the Cup final success “Now we can look forward to next season and kick on and give it a real go in the Premier League.” you have the feeling that the focus has moved up a level and a tilt on Chelsea‘s league title is all that matters at the Emirates for next season. For many seasons it was leveled at the squad that they have no winning mentality, that has changed in the last two seasons. Additions of Mesut Ozil and Alexis Sanchez has helped develop the squad’s mindset to a more competitive one resulting in back to back FA Cup successes. Next season will be huge for this Wenger squad anything less than a challenge will leave the natives restless and demanding more for their entrance fee.